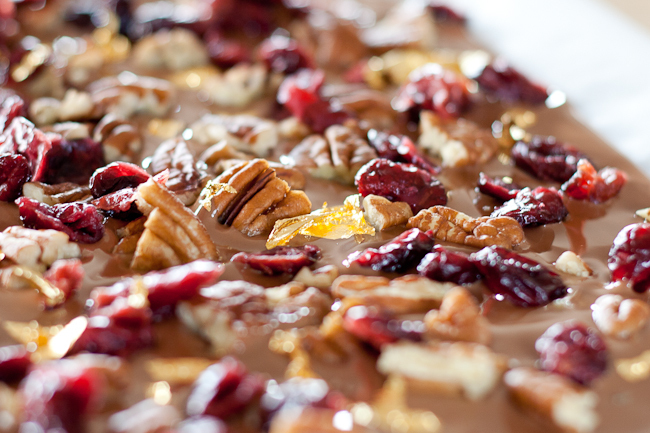 Chocolate Bark — What the Fruitcake?! Chocolate bark is really fun & easy to make (kids love making this stuff!). You can also decorate it with almost anything you like, nuts, dried fruits, seeds, crushed candies, honeycomb etc. The whole idea of chocolate bark is that it’s rough in texture and look, just like bark. You can cut it in neat squares, or my favourite, break it up in rough pieces. It’s also great to use up left over tempered chocolate, either plain or if you’ve mixed in crushed nuts to use for coating truffles. This is another chocolate that is great as a gift. Very quick and easy to make, you can be as creative as you like with toppings and it looks delicious! Below is the base recipe for chocolate bark, but I've also included three flavour ideas. I really loved the roasted pecan nuts with the tangy cranberries and I absolutely loved the colours of the red with the gold leaf, very Christmassy! The crystallised ginger went beautifully with the banana chips and cashews and melded beautifully with the creamy white chocolate. But our absolute favourite was the coffee bean, apricot & hazelnut bark. My hubby and I couldn't stop nibbling at it! Not only does chocolate bark make a tasty stand alone treat, you can also use it as a garnish on cakes, cupcakes, ice-cream sundaes and desserts. Everything about it is fantastic! 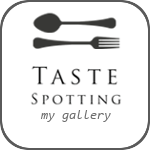 Posted on August 27, 2011 by Mandy Mortimer and filed under Chocolate, Daring Baker and tagged Candy Chocolate Chocolate Bark Dried Fruit Gift Nuts.